The conventional format of concert presentation is prescribed only to maintain the overall effect of the concert and is not mandatory. However, the success of a concert is the primary concern when formulating an overall concert plan. The artiste usually decides the plan of his / her concert depending on the place, the occasion, duration and the expected appreciation levels of the audience. Before we go into that, there is one important aspect of Carnatic music, improvisation or Manodharma, that has to be elucidated. We shall now go into the details of each. In this form of pure melodic improvisation, the musician renders a series of phrases so as to create the mood of the raga and lay a foundation for the composition (and probably other creative aspects) to follow. This is considered to be the most important aspect of Carnatic music. A raga expansion may be compared to a journey of exploration, each step promising more. The fact that neither the artiste nor the audience know what may be created adds romance to the exercise. This does not mean that the whole affair is devoid of any strategy whatsoever. The artiste generally goes with an idea of the layout of the alapana, although the details would take shape only as he or she performs. In a concert, one will find raga alapanas of varying duration, ranging from a few seconds to 15 to 20 minutes (or even more if circumstances warrant). Some songs may even start without this preamble. Though often rendered sans percussion, the element of rhythm is more obvious in this type of improvisation. It is generally rendered in medium speed and just before commencing the main piece or a special piece known as Ragam Tanam Pallavi. The Tanam is supposed to be sung using the words Anantam Anandam (meaning eternal bliss, a concept of Hindu philosophy). However in practice, the break-up of the above-said words, like anamta, namta, nomta, tanom etc, are used. This improvisation is nothing but an extension of the song itself and thus has all the three facets of Carnatic music, namely, melody, rhythm and lyrics. The idea is to take a meaningful line of a song and elaborate it melodically keeping the lyrics constant. These are swara (solfa) improvisations around a song and are considered by many as the most exciting aspect in Carnatic music since, a sort of contest develops on the stage among artistes. The lead artiste plays something challenging and the accompanists try to repeat it or even go one better! The main artiste is generally not put off if they succeed. On the contrary, he is spurred on to play at a higher level and this goes on as the listeners watch with bated breath. Finally, all the artistes join in a grand climax, which could be a simple arithmetic calculation woven into the music, called the korvai. There can be a variety of these korvais of varying length and complexity. There is also another aspect called kuraippu, in which the artistes at a certain point, start tapering the length of their kalpanaswaras, until it almost comes to just 1 or 2 counts (aksharas). The main korvai is usually preceded by the kuraippu as a build-up. This adds to the atmosphere of the concert. This is one of the most complete aspects of manodharma incorporating all the different aspects that we talked of above. The word Pallavi is derived from the three syllables Pa - Pada (words), La - Laya (rhythm) and Vi - Vinyasam (variations). Though, there is a mention of the word Pallavi in Sarangadeva's Sangita Ratnakara in 13th century, this form did not evolve until the 18th century. Structure: The Pallavi is normally a one-line composition set to a single cycle of tala. The lyrics may be devotional or secular in content and may be in any language. The tala could range from the simple to the complex and one may also find the different gatis being employed. Special Features: As the very name suggests, the Pallavi consists of the Raga alapana and the Tanam (which is not usually rendered if the main item happens to be a kriti). Therefore, one usually starts with an elaborate raga-alapana followed by the tanam. The other creative aspects follow. Neraval is done on the Pallavi line in the medium and fast speeds. This requires a good command of the raga and tala. Tri-kalam: Tri means three and Kalam refers to the tempo / degree of speed. In this section, the Pallavi line is sung in three degrees of speed while keeping the speed of the tala constant. The first is the normal tempo of the Pallavi, the second is twice as slow as the first and the third is twice as fast as the first. Tri-kalam is normally followed by kalpanaswara in medium and fast speeds. Kalpanaswaras could also be sung in different ragas and this is called ragamalika swara. The artiste however returns to the Pallavi line at the end of each raga section. Kuraippu can again be done using the original raga of the Pallavi or in ragamalika. However the korvai is generally sung in the original raga of the Pallavi. Following this, there is a Tani-avartanam by the percussionists. Purpose: The Pallavi is a challenge to the performer’s ability to improvise with complex and intricate patterns. The whole exercise is very demanding and challenging, both technically and musically, since all the artiste's musicianship is put to test. The key words in a Carnatic concert are variety, proportion and totality. A competent professional tries to include all the vital aspects of Carnatic music in different proportions in the concert and strives to create a good overall effect. There are artistes who meticulously plan the content and package of their concerts. There are also artistes who don't plan too much but go on stage with an open mind and perform according to their instinctive judgement of the audience, their own mood and form, the capacity of their accompanists etc. The conventional mode of beginning a concert is with a Varnam (For details see Varnam in Sahityanubhava). This can either be rendered in a brisk pace (usually madhyamakala) or in two degrees of speed in the first half and madhyamakala from the Charanam onwards. The Varnam is generally regarded as a warm-up piece, which sets the pace and mood of the concert. However, some artistes prefer to start their concerts with an invocatory piece, usually, a kriti (Refer kriti in Sahityanubhava) on Lord Ganesha, who is believed to bestow success upon one's endeavours. Occasionally both Varnam and the invocatory song are rendered in the same concert. This kriti is sometimes rendered with the improvisation of kalpanaswaras. The opening piece is generally followed by a couple of brisk kritis with or without improvisations. If rendered with improvisations, it may be a short raga alapana or a few rounds of crisp neraval and kalpanaswaras. This is usually followed by a slower kriti with or without raga alapana. Then the performer renders the main piece of the concert in an elaborate fashion. It could either be a weighty kriti or a Ragam Tanam Pallavi. The main artiste then gives an opportunity to the percussionists to rhythmically embellish the given melodic theme, with the Tani Avartanam. This is followed with a sprinkling of the lighter variety of songs, like Ashtapadis, Bhajans, Padam, Javali, Ragamalika, Tiruppugazh and Tillana. Occasionally, slokas or viruttams are rendered. These are nothing but verses in Sanskrit or Tamil with devotional or philosophical content and are rendered like an alapana sans tala. The concert concludes with the Mangalam, which is a prayer for world peace and prosperity. Musical compositions: It would be ideal to have a variety of musical forms like varnam, kritis, padam, javali, tillana, tevaram, tiruppugazh, kavadi chindu and other minor compositions. Composers: Since Carnatic music is rich in compositions by great composers, one has a lot of choice. 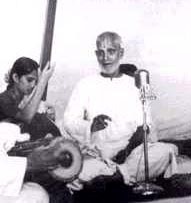 It would be ideal to include at least one composition of the Carnatic Trinity. Besides, one could pick from other great composers like Purandaradasa, Annamacharya, Gopalakrishna Bharati, Papanasam Sivan, Swati Tirunal and others. Ragas: A performer should include ragas of contrasting notes with different structures like Sampoorna, Shadava, Audava etc (Refer Janya ragas in Raganubhava). The other aspects to be considered are the emotive feel, scope and the origin (Carnatic or adopted from other systems like the Hindustani) of the Raga. Talas: One should properly balance the four popular Talas, Adi, Roopaka, Misra and Khanda Chapu. (Refer Popular talas in Layanubhava). Apart from this, it is also possible to choose compositions in other less frequently used talas. This gives rhythmic variety to the concert. One could also bring about contrast by singing compositions of different tempos or speeds. There can be another variety based on the starting point of the song to that of the tala, i.e, the eduppu or graha. Prosodic Theme: One again has a huge variety in this, ranging from devotional to philosophical to patriotic to romantic. It is worthwhile to note that there are no separate compositions for instrumental music. The instrumentalists play the same compositions as the vocalists. Languages: A concert could also have compositions from a variety of languages like Sanskrit, Telugu, Tamil, Kannada, Malayalam etc. Creative Elements: The clever permutation and combinations of the different creative aspects (manodharma) that are mentioned above could bring in a lot of variety. Classicism content: This can be done by highlighting the broad outlook of Carnatic music, wherein, even the melodic forms of other systems are adopted to a Carnatic mould in an innovative yet traditional fashion. Examples, a composition in a Hindustani-based raga or a Bhajan in a semi-classical tune. Solo, Duet or Trio. Occasionally, we come across an ensemble or a group presentation. Jugalbandis (Carnatic and Hindustani combination) or fusions (Carnatic and Western or other systems) concerts. Thematic concerts: There can be concerts based on a variety of themes like, composers, ragas, festivals, different deities or creative aspects like Ragam Tanam Pallavi. Main Performer: Could be either vocalists or instrumentalists. Instruments like the Vina, Flute, Chitravina, Jalatarangam, Saxophone, Mandolin, Guitar, Electronic Keyboard, Violin (it is used both as a lead instrument as well as an accompaniment), Nagaswaram etc are considered major solo instruments. Accompanists: The number of accompaniments varies depending on whether it is a vocal or an instrumental concert, and if the latter, upon the type of instrument. For a vocal concert, it is conventional to have a violinist to provide melodic support. The violinist generally follows the main artiste and during the creative aspects, is provided with an opportunity to both show his potential and also to provide the necessary short breaks to rejuvenate the main performers spirits and creativity. The mridangist provides basic rhythmic support. He accompanies the main performer wherever the music has tala both in the creative and re-creative parts. Occasionally, he accompanies the main artiste even during tanam. He too gets his turn to display his skills in the Tani avartanam. There are occasions where the mridangist becomes the lead performer (in rhythmic ensembles). Position: The violinist and the mridangist are generally seated on either of the main performer facing each other. In a string instrument concert, where the vina or the chitravina is the main instrument, violin is occasionally used. However, the mridangam is present. In the case of flute, viola, jalatarangam, mandolin and guitar, both violin and mridangam are used. In violin concerts, the mridangam is used. In the case of saxophone or clarinet, both violin and mridangam are used according to the artistes' choice. Sometimes, tavil is also used to provide rhythmic support with or without the addition of mridangam. In the case of nagaswaram, it is conventional to have one or two tavils to provide the necessary rhythmic support in place of mridangam (mainly to match the intensity of nagaswaram). Nagaswaram is also accompanied with the Ottu for support, a Sruti-box to provide the basic drone and a cymbal player to provide tala. Other accompanists: There are other accompanying instruments, which are optional. They basically enhance the rhythmic effect in a concert. Termed as Upapakkavadya, as they follow the mridangam and thus blend well with the main performer too. The instruments that generally follow in this category are Ghatam, Khanjira and Morsing. Occasionally there is also oral rhythmic support, known as Konnakkol. The position of Ghatam, Khanjira, Morsing is generally behind the main artiste unless the violinist is absent, in which case, the Upapakkavadya artiste takes the violinist's position. Drone support is a must for any Carnatic concert. It is generally provided with the help of one or two Tamburas. Electronic tamburas or sruti-box also provide drone support. From 1895, the concert scenario in Carnatic music has taken a new dimension with the emergence of Sabhas. Sabhas are generally institutions that promote cultural or religious activities for a group of members. The Sabhas generally collect memberships from art-lovers and patrons or get sponsorships from culturally-conscious corporate bodies and thus help in preserving and promoting Carnatic music. They generally organize monthly programmes. Some of them also conduct annual festivals / music conferences (like the December music festival in Chennai), featuring concerts by senior, popular and upcoming musicians. Lecture-demonstrations and the like by leading musicologists and scholars are also organised once in a while. Sabha concerts are conducted in closed acoustically designed auditoriums or in the open air, on a raised platform. All over the world there are plenty of organisations helping preserve and promote Carnatic music. Occasionally educational institutions or music conservatories also organize music programmes. Besides, mass media like radio and the television regularly feature Carnatic concerts too. Acoustics in a concert: In olden days, Carnatic music concerts were mike-less concerts held in temples or in the open air. So, a vocalist had to necessarily sing full-throatedly. Only instruments like nagaswaram were used to lead religious processions (this is followed even now) simply because of the intensity of the sound produced even without amplification. Other instruments like the vina / chitravina could be performed only for a relatively smaller gathering. However, with the advent of microphones and other electronic devices, acoustically designed auditoriums and good recording theatres, it is now possible to project the microscopic beauties of the music and the voice / instrument. Art patrons: In olden days Kings, nobles and landlords promoted music. However, that trend has changed with Sabhas, institutions and other corporate bodies taking over. Rasikas: They are the music lovers who motivate and inspire the performer to perform to their potential. But for them, this classical art form would have long become extinct. Sabha secretaries and other committee members: They contact, arrange and organize performances of various musicians and have a dual task of maintaining the sustained interest of the music lovers and providing opportunities to musicians. Music critics: The music critics have a major role in spreading music through mass-media like the newspaper.